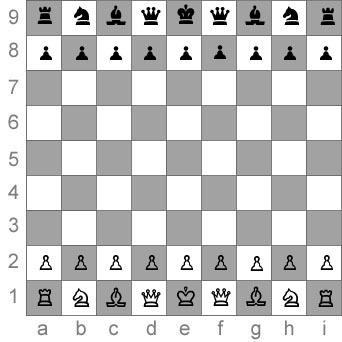 Two queens, both bishops are on dark squares, so the first bishop move should be made like a knight. The 9x9 board is fascinating. Would love to see how computers handle it. This is one of myriad variants. I like Capablanca chess which incorporates two extra pieces. A chancellor which combines powers of a rook and a knight and an archbishop which combines powers of a bishop and a knight. A program that incorporates many variants is called “Zillions of Games 2”. It has engines that can handle different variations. It stomps me in Xiangqi (Chinese Chess). Also Xboard (Winboard for Microsoft platforms) has a few variants and engines.